Alisa Barrett, standing, director of instruction for Greenfield schools, speaks to the school board about the recently-released State Report Card for the district. With a new district report card out, and the district with an overall D, educators with Greenfield schools highlighted significant student improvement to board of education members that they say may not have been seen past the letter grade. Alisa Barrett, director of instruction for Greenfield schools, and Rainsboro Principal Quiney Gray told the Greenfield Board of Education that there have been marked improvements since last year. One of those, according to Barrett, is the district’s gap closing score. The component measures how well schools are meeting performance expectations for its “most vulnerable students,” according to the report card recently released by the Ohio Department of Education. While the overall grade was a D, last year’s percentage was just more than 19 percent, and this year’s “measurable objectives” were at 66.7 percent. Seeing that much improvement in the percentage, she said, makes that overall grade not look so bad, since it shows tremendous growth. Other gap closing successes, she said, were that not only did Rainsboro Elementary go from an F to an A, but three other schools in the district went from F grades to higher scores. Another point was the four-year graduation rate. McClain High School received a C, an improvement on last year’s F. According to McClain Principal Jason Potts, the school is less than 2 percentage points away from a B. And last year’s F, he said, was largely due to 19 students who dropped out. Of those 19, 12 had been at McClain less than two years, six had been at the school less than a year, and only three were at the high school all four years. Barrett said half of the more than 20 tests that the report card is based on showed an increase in proficiency, but was still short of the 80 percent required by the state. She said that educators continue to focus on educating the whole child, helping to get each individual student’s educational needs met, and continually striving for each student’s achievement. To view the district report card, go to education.ohio.gov. In other business, superintendent Joe Wills reminded board members that Friday, Sept. 24 is homecoming with activities beginning at 6:30 p.m. McClain is scheduled to take on Troy Christian High School. Wills also noted enrollment numbers for the inaugural year of JROTC in Greenfield. He said there were 23 middle school students enrolled, and 49 high school students enrolled, with 10 of the latter also in the drill class. According to Potts, the new program so far has gone really well. In other matters, board members approved the following employment recommendations: Spring Rhoades, LPN; Megan Halcomb, certified substitute; Aimee Gaines, certified substitute; Francis Davis, aide/monitor, clerical, cafeteria; Randalia Clay, bus driver; Jeanna McNeal, technology at Greenfield Elementary; and Losson Upp, fall weight room supervisor. The Greenfield Exempted Village School District meets in regular session next on Oct. 15 at 7 p.m. in the central office boardroom in Greenfield. The public is welcome. 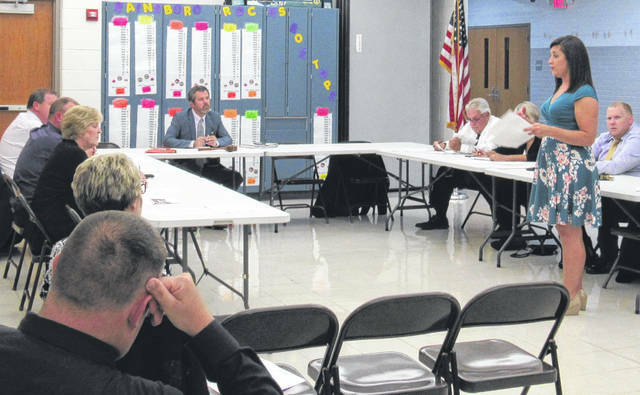 https://www.timesgazette.com/wp-content/uploads/sites/33/2018/09/web1_Greenfield-board-pic.jpgAlisa Barrett, standing, director of instruction for Greenfield schools, speaks to the school board about the recently-released State Report Card for the district.